This drink chiller turns any non-carbonated beverage ice-cold in less than 60 seconds. 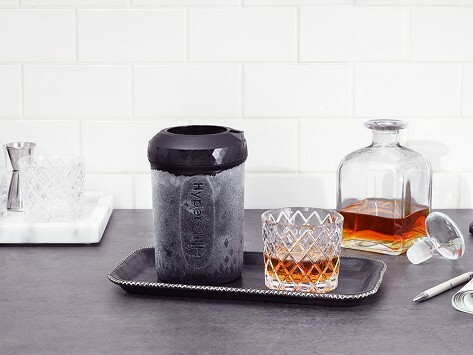 Pour in hot coffee, tea, whiskey, wine, juice—whatever you’re drinking, and enjoy it iced in a minute without ice cubes that dilute the taste. Prep your HyperChiller by filling up the chambers, then freeze for a full-fledged cooling system. It’s even designed to fit under most coffee makers, so you can go straight from brewed to brrrrrrrrr. Dimensions: 4.25" x 4.25" x 6.75"
This drink chiller satiates any cold drink craving in just about a minute. 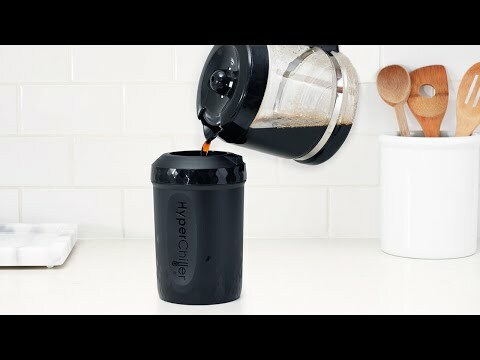 Pour straight from your coffee maker, tea kettle, or French press into the HyperChiller capsule. 60 seconds and minus 130 degrees later you’ll have an undiluted icy drink to freshen your day. It even slips comfily under most single serve coffee makers, kind of like a mug. Load up HyperChiller’s inner and outer stainless steel chambers with water, twist them into place, and stick them in the freezer. You’ll wake up to a functioning rapid drink chiller for your coffee, wine, juice, whiskey—virtually any beverage that’s un-carbonated. Instead of heading to the coffee shop for a drink or planning in advance, you can cool up to two 12 oz. drinks before refreezing HyperChiller for the next day. Next time you’re craving a fresh-brewed—but cold—drink, you simply need to wait a minute.